An adventuresome flavor, created by an unusual processing method. Full-bodied and elegantly complex, every sip of Sun-Dried Ethiopia Sidamo™ is absolutely sumptuous. We love it for its notes of soft pepper, dried dark cherry and chocolate. 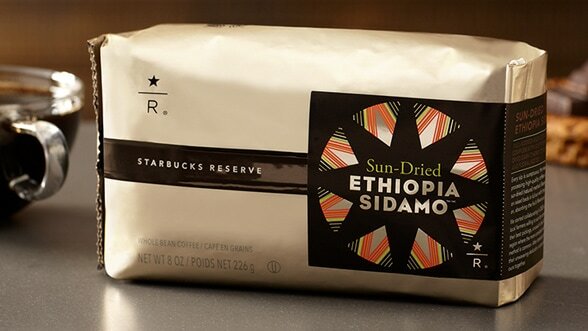 This coffee is born of a collaboration between Starbucks and Ethiopian coffee farmers that started in 2005. In Sidamo, most coffee is processed using the washed method. We worked with smallholder farmers who applied the natural processing method on their very best beans. The beans are spread on raised beds in the full sun with the cherries still on. Each bean absorbs the fruit’s flavors as it dries, and that is part of the wonderful taste you experience. We invite you to enjoy this coffee while it is in our stores.